Let's face it, Dad has enough ties, tools and gadgets...give him what he really wants - BACON!! 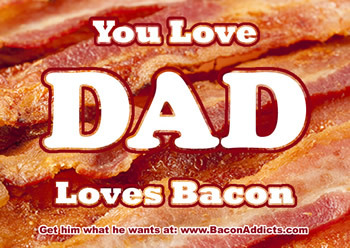 Celebrate fatherhood and honor the special Dad in your life with these unique and thoughtful Bacon gifts that Dad will love! GRILL PINZ! 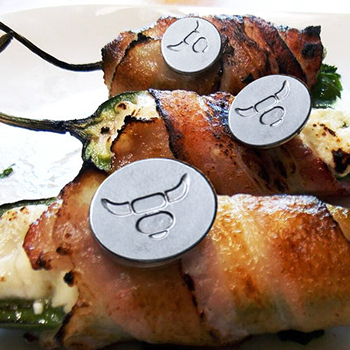 We've got the perfect gift for the BBQ loving Dad that already has everything...Grill Pinz! Grill Pinz are a unique new product that combines two great things - barbecue and Bacon! They are specifically designed to hold Bacon securely while grilling. Bacon wrapped cooking has never been easier! Made from one piece of food-grade stainless steel and come in an 8pc set with gift box. Dads that love Bacon need Grill Pinz! BILL E's BACON! Sometimes a gift is just sooo good, you want to keep it for yourself! Bill E's Bacon is beyond good...it is small batch, handmade, artisan Bacon that has been cured and smoked to absolute perfection. Warning! After trying Bill E's, Dad may never eat supermarket Bacon again (you have been warned!). 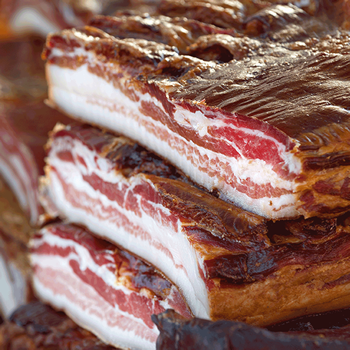 Available in 3-5 lb Slab Bacon or Thick Sliced Bacon. BACON ROSES BOUQUET! Who says Dad doesn't want flowers? 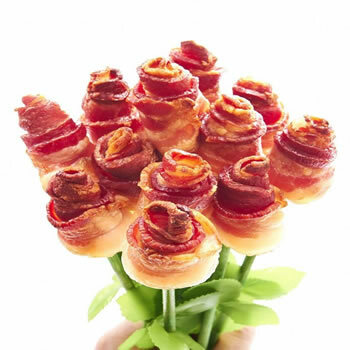 Well, maybe not any old flowers...but he will LOVE Bacon Roses! Bacon Roses are a unique twist on the traditional rose bouquet..they are both delicious and beautiful. The World's Best Dad deserves the World's Best Roses! SWEET & SALTY CANDIED BACON! 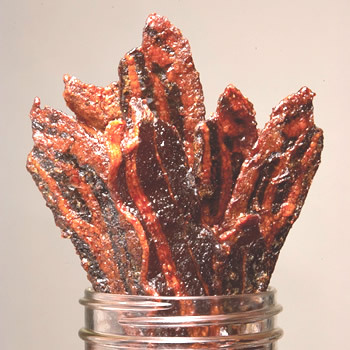 There are few things as delightful as sweet, salty and crunchy Candied Bacon! These thick cut slices of Candied Bacon are fully cooked and ready to enjoy! Candied Bacon is deliciously addictive. Perfect for Dad's with a sweet tooth (or meat tooth!). Available in two flavors: Sweet Brown Sugar and Spicy Habenaro or try BOTH flavors with the Candied Bacon Variety Pack! BACON JAM! If a way to a man's heart is through his stomach...than Bacon Jam will get Dad's heart racing! Sweet, savory, smokey and Baconey...how can you go wrong? Bacon Jam is the perfect condiment for everything from snacks, sandwiches, appetizers, meals and even desserts! 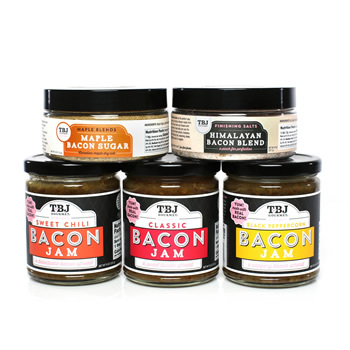 The Big Boar Bacon Jam Sampler includes three Bacon Jam flavors, plus Maple Bacon Sugar & Himalayan Bacon Salt. BACON OF THE MONTH! 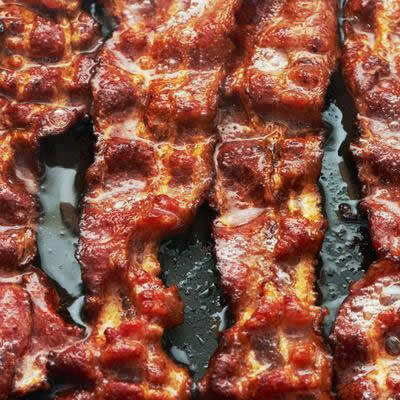 What is better than Bacon? MORE BACON! What is better than more Bacon? Bacon that keeps on coming...month after month!! With our Bacon of the Month Club, every month Dad will receive a selection of slow-cured Bacon in innovative, mouth-watering flavors. Each monthly shipment includes two new and delicious flavors (1 pound each), produced with only the finest, all-natural ingredients. 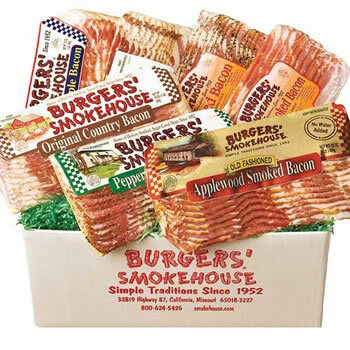 BURGER'S SMOKEHOUSE BACON BOXES! You were Dad's bundle of joy...now you can give him another bundle he will treasure - a BIG box of Bacon! Sure, Dad has had Bacon. But once he tries Burgers Smokehouse Bacon that’s dry cured, slow-smoked over natural wood chips with no water added, there’s no turning back. Who knows. maybe if you're good...he'll share?